snowdeal.org > ex machina: no longer certified organic. gah. after nearly 3 months of suffering from rivers of mucus, mountains of phlegm and a persistent cough, i finally threw in the towel and decided it was time to visit the doctor and hear what i had already surmised - that i had walking pneumonia and it was time to pummel the bugs in my respiratory tract with a course of that old antibiotic standby erythromycin. i haven't taken antibiotics in probably 10 or 15 years and while i'm happy that the drug is efficiently doing its thing, i don't really recall it making me feel so, um, uncomfortable, which i presume is the result of it wiping out the good with the bad. Take a probiotic. Its about 50,000x stronger than yogurt and keeps your system balanced while on antibiotics. They're sold over the counter and are totally safe. thanks for the advice. i've been eating yogurt and while i think it's been having some positive effect, it's not nearly enough to counter the side effects of the antibiotics. I think that timing may be important, though (correct me if I'm wrong). You don't want to take the probiotics at the same as the anti's because the anti's can get distracted... I've done it, but it involves a fair amount of pill juggling. Hi- According to my doc and the pharmacist (I wanted to be sure) you are wrong. It doesn't effect the antibiotic in any way and you can even take them together. I think it's the choice of antibiotic you got. 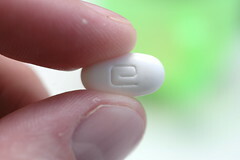 E-mycin can make you miserable if you do or don't do certain things. See drugs.com/erythromycin.html for one list of problems. I sure hope the Dr. and pharmacist pointed these out already.